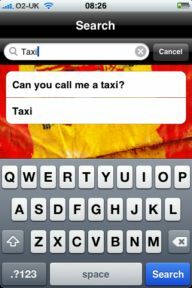 Coolgorilla has announced a new talking phrasebook application for iPhone and iPod users who love traveling around the world. The talking phrasebook application is available in seven different languages include Spanish, German, Italian, French, Greek Portuguese and Japanese. Phasebook application allows users to enter the text in English and then translated the text into desire language together with speak out in foreign language. Beside that, it contains over 500 sound files which topics related to travel such as eating, accommodations and etc. It also allow to quick and easy search for phrases. According to Roy Forsdick, the MD of Coolgorilla that they has started developing the talking phrasebooks since 2005 and spoken to hundreds of travelers to find out what phrases they would like to see. Currently, it is available to download from App Store for the price of $0.99.